In Seattle Piggly Wiggly competed with the companies that became Tradewell Stores for 15 years. 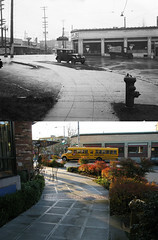 This article is fifth in an exploration of Seattle’s chain grocery history, focusing on the predecessors of Tradewell. Tradewell was christened in October 1939, based in Seattle, and spread stores down the West Coast. But it carried on a long, twenty-four year legacy of self-service chain stores in Seattle. Piggly Wiggly in Washington State split into half that joined Tradewell’s immediate predecessor, and half that turned into Tradewell’s main competitor, Safeway. Piggly Wiggly is a chain grocery store that continues today mostly in America’s Midwest and South. It started in Tennessee and expanded through regional franchise licenses across the entire country during and after World War One. Piggly Wiggly is popularly remembered as the first American self-service chain grocery, starting in 1916. As discussed in the Groceteria article, Piggly Wiggly was actually beat to that business model by several stores including Seattle’s Groceteria stores in 1915. By the time Piggly Wiggly arrived in Seattle, Groceteria had been in business for six years and had 30-odd stores mostly in the city but also around the region. 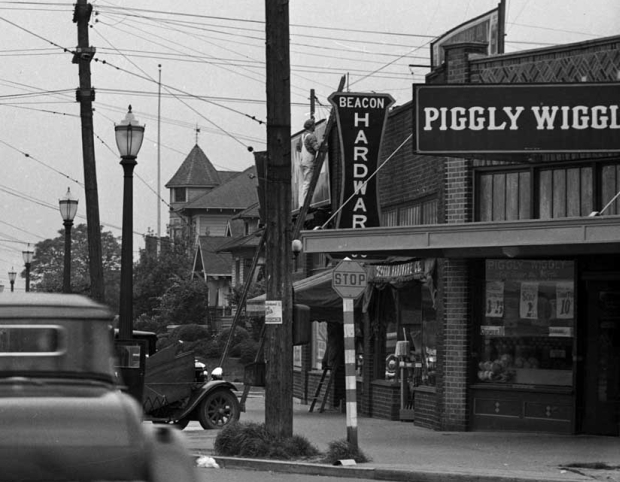 Seattle was the first city in Washington State to get Piggly Wiggly stores, a pair that opened November 1921. The franchise was granted to Arthur H. Jones’ company Jones Piggly Wiggly. Jones grew up in Navarro, Texas in a large family, son of grocer John D. Jones. He became a selling agent for Van Camp Packing Company, which still exists as a brand of canned beans but at the time sold all kinds of produce wholesale. In that capacity he came to Seattle and was an early seller to Groceteria Stores. Arthur and his wife Virginia lived in Seattle from at least 1917 while he continued traveling for Van Camp. He registered for the draft that year in Seattle but escaped World War One because of his dependent wife and son. In 1921 Jones suddenly announced that he had purchased the Piggly Wiggly franchise for Washington State and would begin opening stores. Piggly Wiggly was focused on non-perishable goods with some produce. The first two stores were in public markets where the co-location of butchers, green grocers (produce), bakeries, and other food vendors provided convenience to shoppers. One of the public markets was the Liberty Market just north of the northeast corner of First and Pike Street. The Liberty Market was in the first floor of a three-story building adjacent to the Liberty Theatre. Piggly Wiggly had offices in the back of the market until the building was demolished in 1924. After a brief hiatus Piggly Wiggly returned to the new building next to Liberty Theatre with its own storefront in 1927. This storefront is now part of Deja Vu. Queen City Market was the other, located on the southwest corner of 4th and Pine Street. This was Piggly Wiggly’s main store downtown. It closed briefly in 1931 as the market building was renovated, but otherwise remained a Piggly Wiggly until it converted to Safeway in 1936. 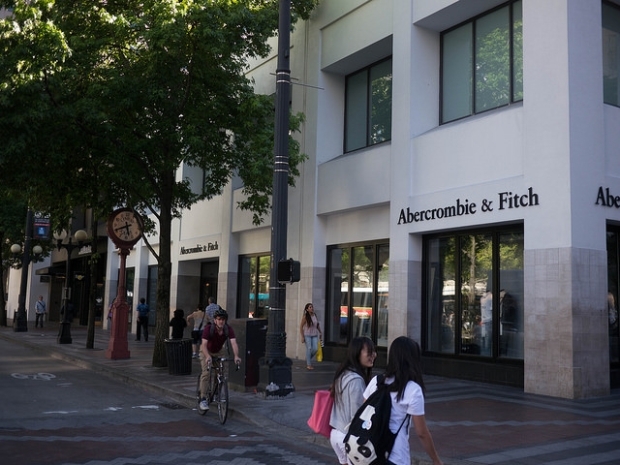 The Queen City Market building now houses Abercrombie & Fitch, Dr. Martens and other retailers. By 1923 Piggly Wiggly had thirteen stores in Seattle. Most were within a block of a Groceteria, but three were quite distant. The Beacon Hill location (pictured below) opened in November 1922, competing with the Groceteria in the South End Public Market (Tashiro-Kaplan Building) that targeted Beacon Hill commuters. A store in Madrona opened in August 1922, 11 blocks from a Groceteria and another Piggly Wiggly at 23rd and Union. Piggly Wiggly also opened at the crossroads of Eastlake and Harvard at Roanoke Park and Portage Bay, almost a mile from the nearest Groceteria. Piggly Wiggly had established neighborhoods of its own and began winning the head-to-head competition with Groceteria. In 1926 it reached 25 stores just in Seattle. The company split and received new investment as Piggly Wiggly of Puget Sound and Piggly Wiggly of Washington. 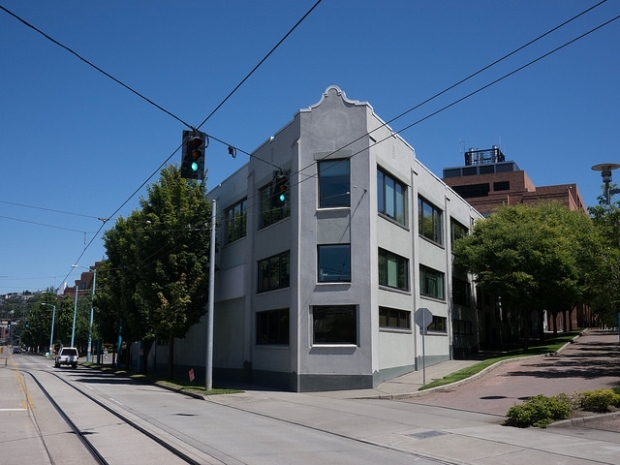 A new building with offices and warehouse was built at 1000 Fairview Avenue for the Puget Sound franchise, which operated stores in Seattle and King County. Piggly Wiggly had defeated Groceteria at this point, in just five years. Groceteria began to shed stores and eventually declared bankruptcy in 1927. Piggly Wiggly was victorious, but new competition stepped in immediately in the form of Anderson’s Markets and Eba’s Stores. 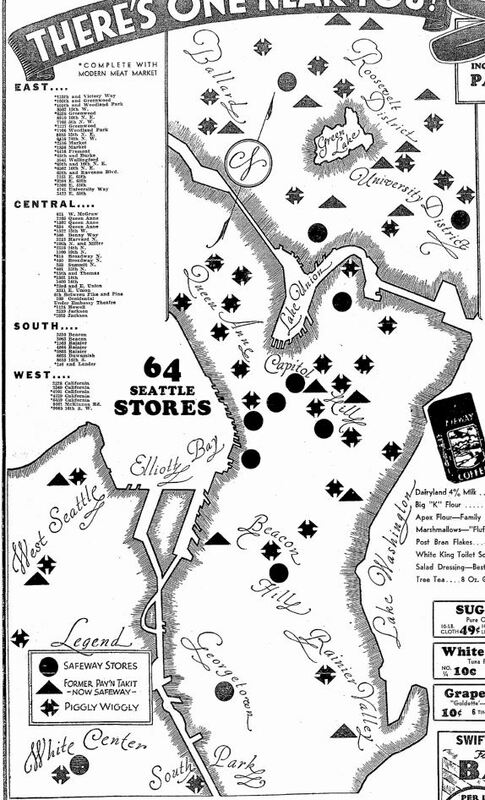 KML for Piggly Wiggly Stores of Seattle, 1929 locations plus all other known locations. Arthur Jones was still listed as president of Jones Piggly Wiggly through the 1929 Polk Guide. However, already in 1922 a separate Piggly Wiggly Washington Company appeared in the directory, including the list of the stores in Seattle. The exact corporate relationship is not clear but Jones remained involved with the Piggly Wiggly franchise. In Dotty DeCoster’s history of Piggly Wiggly on 15th Avenue, she focused on William L. Avery as president of the local Piggly Wiggly. Indeed, Avery was president of Piggly Wiggly Washington for many years. 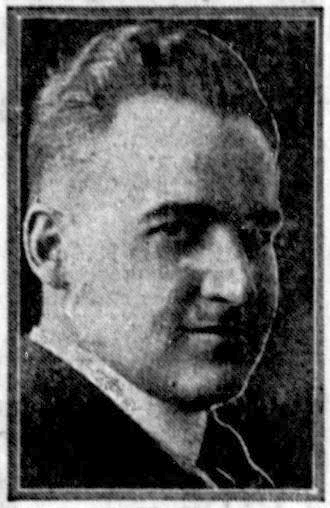 However he was never mentioned in the weeks leading to the 1921 creation of the franchise, and in early ads was simply listed as manager of the Liberty Market store. Jones apparently created the franchise and perhaps held a parent company while Avery ran the first store and took leadership of operations of the chain. In November 1926 Jones started a new self-service grocery chain in Seattle, Saveway Stores. They went big early, with a ten-page ad section in the Seattle Times. 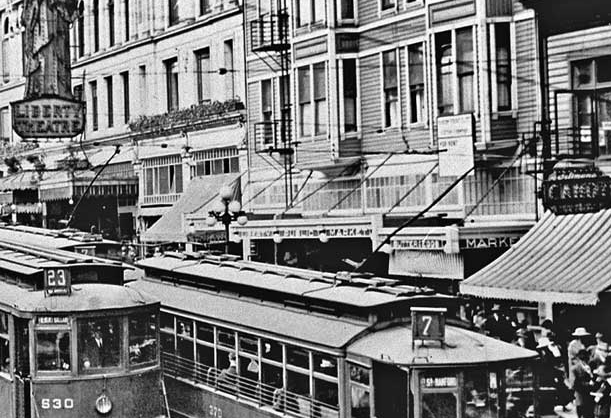 The first store opened on Queen Anne Hill at 2 Boston Street and the second near Pike Place Market at 215 Union Street. Three months later Piggly Wiggly of Tennessee sued Jones, claiming that he had infringed on their patents. Although the patents were probably not enforceable, Saveway seems to have vanished. No further advertising or mention appeared in the Seattle Times. Some of the filler from the ten-page ad for Saveway in the November 12, 1926 Seattle Times. Jones began another chain, Pay-‘N-Save, in 1930. That was directly linked to Tradewell through several mergers, known eventually as Eba’s Mutual Piggly Wiggly. The Washington Piggly Wiggly stores outside of Seattle and Tacoma made up the latter half of the name, acquired after bankruptcy in 1930. I will cover these in an upcoming article on the mergers that led to Eba’s. Piggly Wiggly of Puget Sound was acquired in whole by MacMarr Stores, which in turn was merged into Safeway in 1931. The story of the mergers begins in 1888 when Charles H. Frye moved to Seattle and started a meat packing business with his brother Frank, later joined by their friend Charles Bruhn. Frye’s business boomed after the onset of the Yukon gold rush in 1897, and he became a leading industrialist in Seattle. The art he and his wife collected is still displayed today at the Frye Art Museum. In 1916 they began a subsidiary company, American Grocery Stores, copying the self-service model of Groceteria. This expanded to a small chain of groceries, most in the Pike Place Market area. In 1927 Frye sold the four remaining stores of the chain to Charles E. Marr of Spokane. (The Internet lacks a good history of Marr Stores to point to, so here is the briefest of summaries.) Marr grew up working at his dad’s general store in Missouri. At age 29 he moved to Spokane after visiting Seattle’s Alaska Yukon Pacific Exposition in 1909, and he immediately opened a grocery store. Perhaps influenced by Groceteria, he expanded into a “help yourself” chain and spread east and west out of Spokane. By 1927 his chain had reached 50 stores, and Marr continued to expand. 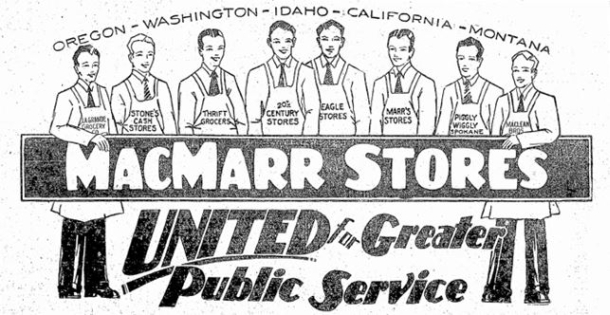 Marr merged with seven other chains in early 1929 to form MacMarr Stores, funded by Merrill Lynch. Piggly Wiggly of Puget Sound had been rumored to be included in the merger in late 1928 but initially remained independent. Soon after the mega-merger, Piggly Wiggly of Puget Sound acquired a number of Tacoma area Piggly Wiggly stores. MacMarr finally merged with Piggly Wiggly of Puget Sound in September 1929, and the former Marr stores were converted to Piggly Wiggly. The entire MacMarr chain merged with Safeway in 1931. Management, merchandise, and distribution were shared between Safeway and Piggly Wiggly in Seattle. Piggly Wiggly continued to operate as a separate brand. Finally Safeway converted all of the Piggly Wiggly stores to Safeway in 1936. Growing up in Wallingford I remember going with my mother to the University Piggly Wiggly, and being amazed by the early automation which swooshed our grocery list upstairs via pneumatic tube and exchanged it for the actual groceries delivered to the checkout counter without visible human intervention. I truly thought the future had arrived. Glad I stumbled on this blog, Paul Dorpat, a friend since the ’60s, has been my sole source of local history, now I’ve got a backup. I also recall gazing from my 5th grade upstairs classroom at Interlake Grade School at the Camel or Lucky Strike billboard atop the new Wallingford Market, which blew perfect smoke rings across N 45th St and Wallingford intersection. Decades later I read that this was one of two, the other in NYC that performed this interesting feat. Rick thanks for the note. I’ve never heard of that automated delivery by Piggly Wiggly. Was this in the 1940s? Thank you so much for your praise. I’m interested in hearing any and all details that you are willing to share…Hopefully some specifics about the time-frame you are referring to. Where the swap-meet is now. I remember wanting a pretty dress on the rack, but mom could not afford it. Piggly Wiggly was just behind the former Labor Ready by delridge/ 17th and North of Roxbury St according to the map. I don’t understand how Pay N Save got into this story. Pay N Save was started by M Lamont Bean. My guess is that Pacific Gamble Robinson owned the Pay N Save name through the acquisitions, and M L Bean was able to make use of it. That’s also my guess on the name “Tradewell”, which appears a couple of years prior on stores that apparently became part of the PGR portfolio turned into the Tradewell chain by Bean.